Some days, he clears rotted drywall and hauls out furniture and carpet destroyed by Harvey's floodwaters. Other days, he chops fallen trees or helps to lay the foundations for new homes. He ventures daily into homes wearing a T-shirt, work pants and tennis shoes, often while surrounded by the pungent stench and raw sewage that flowed into homes during the flooding. "I always wash and scrub myself, and I use alcohol or something similar so that I don't get infected," said Miranda, a native of Guatemala. "I haven't gotten sick yet." Hundreds of day laborers like Miranda have quietly become an integral part of the recovery from Harvey, toiling in dangerous conditions amid the fear of being picked up by immigration authorities. 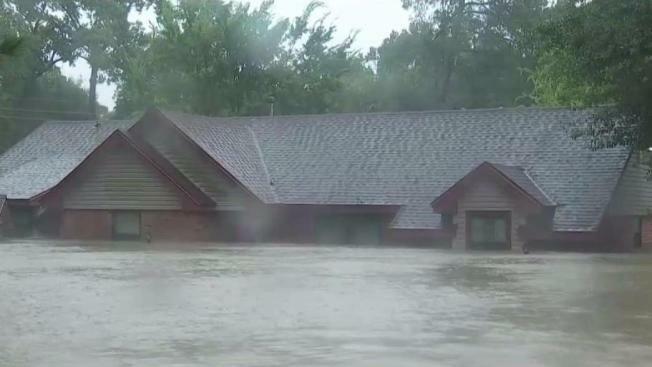 Harvey damaged or destroyed 200,000 homes and flooded much of Houston and smaller coastal communities with record amounts of rain and high winds. In a construction industry that already had labor shortages before the storm, it created a massive demand for the kind of work that day laborers have long performed after hurricanes and tropical storms. Day laborers interviewed by The Associated Press said they've been hired by a mix of individual homeowners, work crews from out of state, and subcontractors working on residential and commercial buildings. Mostly immigrants, they operate in plain sight, gathering early in the morning in parking lots near construction stores and gas stations, and waiting to be offered work. Advocates from the National Day Labor Organizing Network recently fanned out to these sites with pens and clipboards to survey the workers about the conditions they're experiencing. Interviews suggested most are routinely exposed to mold and contamination, and aren't aware of legal protections they have even if they're not in the country legally. Advocates have been passing out flyers with information and holding worker trainings. About a quarter of the more than 350 workers surveyed said they had been denied wages promised for cleanup work after Harvey, sometimes by employers who abandoned them at work sites after they had completed a job, according to a report on the survey by Nik Theodore, a professor at the University of Illinois at Chicago. Around 85 percent had not received safety training. More than 70 percent of the day laborers are in the U.S. illegally, some of them having previously been deported, the survey found. Their wages have stayed at around $100 a day, according to the survey, though some individual laborers said they were being paid more after the hurricane. The problems they face have cropped up after every major recent storm. Day laborers were an integral part of Houston's rebuilding after Hurricane Ike in 2008 and more recent storms that flooded neighborhoods in 2015 and 2016. 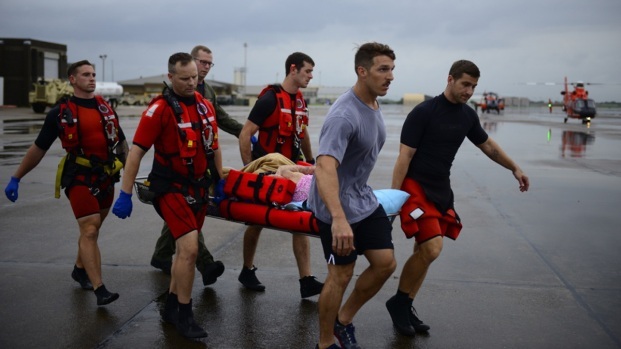 After Hurricane Katrina in 2005, one survey found that workers without legal authorization were being paid less and were less likely to have protective equipment than those who were in the country legally. 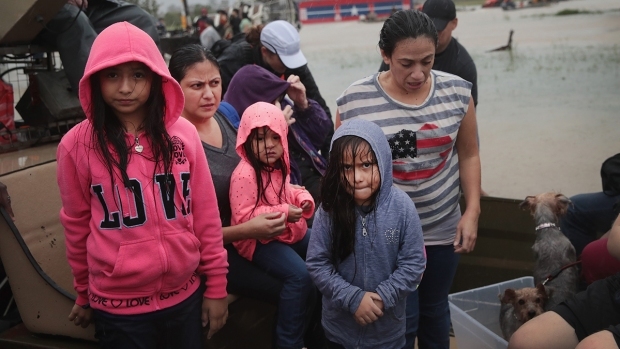 But while the federal government temporarily suspended some work-authorization laws after Katrina, the Trump administration ramped up immigration-related arrests this year and resumed field operations after Harvey. And Texas this year passed a law that prohibits police departments from stopping their officers from asking people about their legal status or cooperating with federal immigration authorities. Much of the law took effect a month after Harvey hit, when an appeals court overruled a federal judge's ruling against it. Martin Mares, a native of Mexico who settled in Houston in 1995, said he's not worried about police stopping him or turning him over to immigration authorities while in the city, which joined several others in fighting the new law in court. But he said he's concerned about working in the suburbs or outlying areas, where law enforcement was more supportive of it. The demand for labor has also drawn in people who are unaccustomed to the work and untrained in basic safety measures, Mares said. He recently saw a pregnant woman cleaning an apartment building that had flooded without wearing gloves. "People don't analyze it. They don't see the consequences," Mares said. "They go to work without knowing whether the business will even pay them." In Houston, which has an estimated 600,000 residents who are in the country illegally, community leaders worry about the impact of immigration policies on worker safety. Even day laborers without legal residency are entitled to federal protections against wage theft and safety hazards. "These people are scared," said Stan Marek, who owns a Houston-based construction company and has long pushed for a program to legalize workers. "They're not going to go to the police if they get robbed. It's a formula for disaster in our community." Sitting on the curb outside the Home Depot recently, Miranda said he has often dealt with employers -- or "patrones" -- who didn't pay what they promised, but that he hadn't reported anyone to the police. "This is a country where I'm here as an immigrant. I don't have anything," Miranda said. "The day they catch me, they'll deport me."